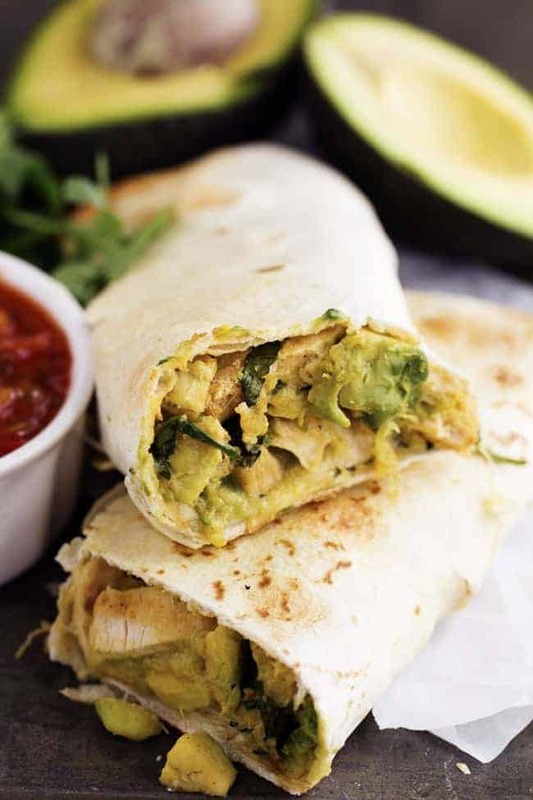 Healthy and easy baked burritos that are stuffed with fresh avocados, cilantro, spices and cheese. A deliciously filled burrito that you won’t have to feel guilty about! Oh man, I love avocados. I think most of my recipes involve avocados. I had to do a little damage control after eating all of these cookies. I decided that I wanted to bake some avocados in a cheese filled burrito for lunch. The result was amazing. The ingredients are simple in these burritos. But they are full of flavor. I loved the fresh avocados in every bite. These burritos are better for you because they are baked. And they turned out perfect. A little bit of crunch on the outside and the inside was soft and filled with flavor. This was a quick and easy meal that my family loved! I already can’t wait to make them again and I know that you will love them too! Preheat oven to 350 degrees. Spray a baking sheet with non stick cooking spray. 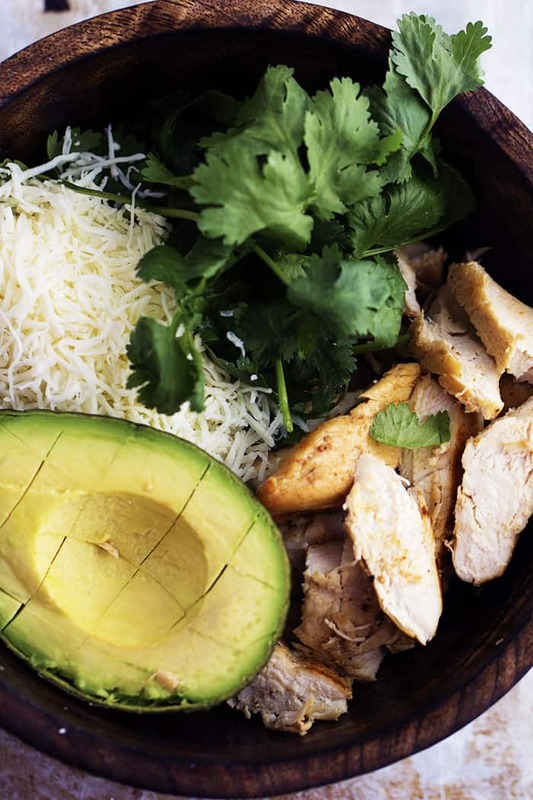 In a medium sized bowl mix chicken, mozzarella cheese, avocados, cilantro, sour cream, cumin, chili powder, garlic powder and salt until incorporated. Spread ¼ of the mixture into the center of a tortilla. Roll up and place seam side down on the baking sheet. Repeat for the remaining tortillas. Bake for 15-20 minutes or until the center is heated throughout and the edges are lightly brown. These are absolutely perfect. Love the flavors! These look wonderful. What brand of tortillas do you use. Can u freeze them after u make it? I was able to freeze mine. I have a Food Saver Vac and Seal appliance ($47) incredibly useful and surefire solution for all your freezing needs. It comes with special plastic bags, the appliance removes air and seals the bags it prevents freezer burn and gives 3x the amount of freezer time than before etc. The best thing to do after you’ve served what you want is to briefly put the pan with the leftovers into the freezer to allow the burritos to set. Take out and divide into portions. Use the vac and seal and you can pop them back into the freezer. Allow to defrost in fridge, remove from bag and spike in the mic. I do this a lot because I live alone and like to take advantage of meat offers. It’s so useful for so many things, in fact I was so impressed I hunted for things I could freeze and the dog went into hiding..Consider it’s a great investment. I froze a pork roast for 3 weeks before using and the taste and texture was as fresh as when I bought it. Really very delicious and easy.